As the deadline for registration is approaching fast, I wanted to share the announcement for our Glocal conference on Communication for Development with you. Örecomm's fourth bi-national conference, jointly organized by colleagues from Roskilde and Malmö Universities, features a very diverse program of keynote speeches, policy panels, academic presentations and documentary film screenings. All the details can be found on the Voice & Matter website. As we are trying to connect with our global friends and partners the conference will be live-streamed and recorded as part of the Glocal Classroom spirit that brings together academic partners from four continents. As difficult as it is to do justice to the fantastic range of keynote speakers and panelists or highlight additional events such as the participatory video workshop (which is already fully booked...) or the screening of Gringo Trails, I would like to draw your attention to the panels which address various topics around ICT4D-from Brazil to youth and civic engagement to emerging issues in C4D and, last but not least, a development journalism panel discussion that I will be chairing and sharing. 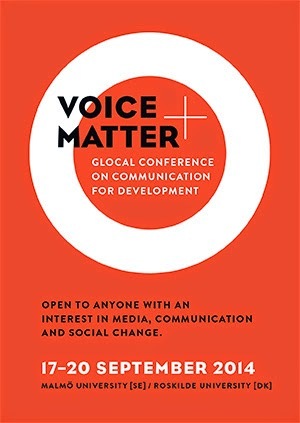 So do join me and the approximately 200 colleagues, students, friends, academics & practitioners that have already signed up for Voice & Matter - online or on site in the Danish-Swedish Öresund region!